I chose this air purifier because of the manufacturer’s promise to fight pet dander and allergens. My son has been suffering from pet allergies for many years and I always pay close attention to pet dander and odor filters in air purifiers. Winix WAC9500 has a 5-stage filtration system, a remote control, sleep mode, auto mode, 4-speed fan, and a variety of sensors. While I’m not too impressed with the design of this unit, all the features it comes with seem useful. Considering all the options available, this air purifier comes with a moderate price tag for what it offers. From the first glance and after reading the specs, the unit appears to be a wonderful addition to any space with pets. Let’s take a closer look. 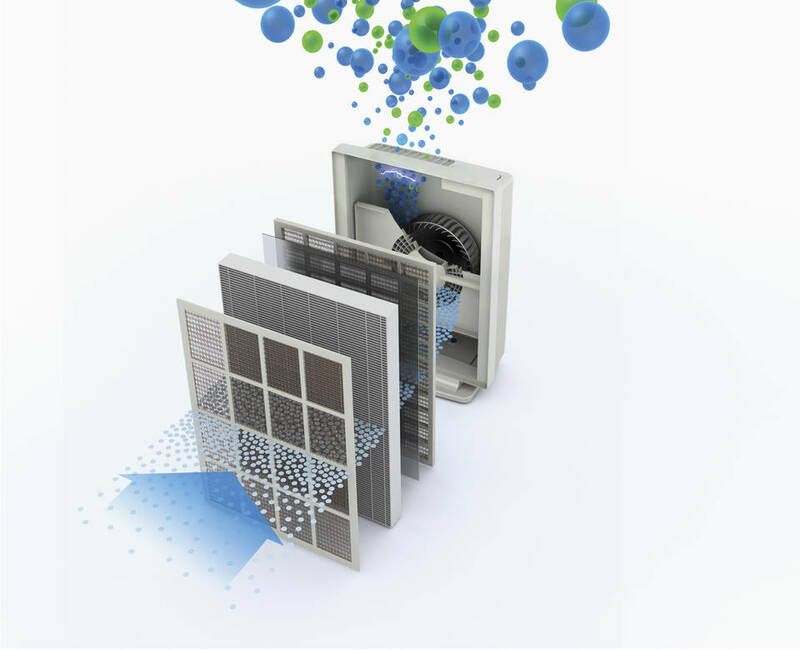 Washable Pre-Filter – This mesh screen is designed to catch large particles so that other filters get less stress. It does a great job dealing with big pieces of dust, pet hair, and other large air pollutants that you can see with the naked eye. The manufacturer recommends washing the filter once every 3 months. However, if you have high dust levels, it would be smart to vacuum it every month or so. It can extend the life of the HEPA filter. True HEPA Filter – It deals with 99.97% of pet dander, allergens, and other pollutants 0.3 microns in size. This filter is the key component of the air purifier since it does most of the job. The replacement period of this filter depends on the quality of your air. In most cases, you would need to replace it once a year. Nano Silver Antibacterial Mesh – This mesh with antibacterial treatment is designed to deal with viruses and bacteria flying through the air. While it may sanitize the air that goes through it, it can hardly keep the number of cases of flu and colds to a minimum. The virus particles don’t just sail through the air, they stay on the surfaces as well. I would say that this filter is mostly useless. Washable Granular Carbon filter – This carbon filter deals with the majority of odors that come from pets, cooking, and, smoking. The manufacturer claims that this filter is specifically designed to deal with pet odors. I have read reviews that it does a good job eliminating all types of odors. This filter needs to be cleaned once every three months, but I would recommend washing it as often as the pre-filter. If you see that the pre-filter is dirty, it’s time to wash the carbon one as well. After all, you have to take the purifier apart to do it anyway. PlasmaWave Technology – This is an ionizer. It deals with odors and makes the pollutants larger and heavier so the rest of the filters can capture them during the next air cycle. Since this ionizer produces both negative and positive ions, some people believe that it may be harmful. You can turn off this option in case you don’t need it. I want to direct your attention to the filter replacement matter. The filter cassette that you need to change at least once a year includes the true HEPA filter, the washable pre-filter, the Nano-silver mesh, and the carbon filter. While this makes it very easy to replace the filtration system, the cassette comes with a hefty price tag. Some users report that you can purchase HF-300 filter, which was initially designed for Fellowes AP-300PH air purifier. That filter comes with a much nicer price tag. However, if you want a perfect fit, you need to get the WINIX cassette. The design is not something the manufacturers seemed to spend a lot of time on. The unit appears somewhat bulky. The purifier weighs about 24 lbs. (about 11 kg). It’s dimensions are 16.5’’ x 8.9’’ x 21.9’’ (40.6 cm x 20.3 cm x 53.3 cm). The purifier doesn’t come with a handle so it’s rather tough to move around. Heaving it up and down the stairs is somewhat complicated. So it’s not one of those units you can use in several rooms of your house by easily changing the location. It comes with a nice-looking digital panel, which is easy to operate manually or with the help of a remote control. When installing the unit, you have to keep it at least 7 feet from such devices that emit electric waves as TVs. It should also be about 2 feet away from the wall in order to provide good air circulation. All this means that even if you don’t like the way the unit looks, you can’t “hide” it almost anywhere. Remote control – You don’t have to get off the couch in order to tell the air purifier what to do. All the operations can be done from the remote. Smart Dust and Odor Sensors – The unit is equipped with sensors that constantly monitor the air quality when the auto mode is on. As soon as the pollution level increases, the purifier automatically pumps the fan speed up. In some reviews, I read that the dust sensor is not impeccable so it makes sense to run the purifier at the highest fan speed at least for 20 minutes a day to make sure that the air is truly clean. The odor sensor does a good job detecting odors even if they come from another room. Sleep Mode – All the light sleepers can appreciate this sleep mode. Once the mode is on, the purifier switches to the lowest fan speed and dims the control panel lights. However, the lights don’t turn off completely. So if you can’t tolerate any light at night, this purifier might not be a good choice for your bedroom. Filter change – The filter replacement light goes on whenever it’s time to change the filter cassette. Remember, this light doesn’t tell you when the washable filters need to be cleaned. It’s up to you to keep track of this matter. Timer – This useful feature allows you to program your unit to start and stop working at a certain time. This is especially useful for people, who spend most of their day away from home. The first level is the perfect choice for a bedroom at night. It shouldn’t be interfering even with the lightest sleep. The 2nd and 3rd levels are akin a typical suburban area background noise, which is satisfactory for daily home activities. The 4th level is similar to a busy office. Such noise can interfere with your reading or quiet conversations. This air purifier is great for living rooms, bedrooms, basements, and kitchens. The only problem you may have is when the purifier works on the auto mode and kicks up the fan setting to the loudest once the pollution gets too high. So don’t forget to change the auto mode to sleep mode during the night. 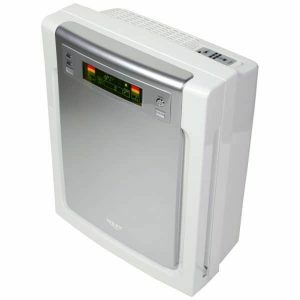 The manufacturer claims that this air purifier can work in fairly large rooms up to 284 square feet. I checked out the CADR ratings to see if the claim is true. Let’s multiply the CADR rating by 1.5 to get the approximation of the coverage area. The result is 273 – 291. Accordingly, the manufacturer’s claim is correct. You should note, however, that the ionizer might have trouble servicing rooms larger than 200 square feet. If you don’t plan to use the ionizer, the manufacturer’s recommendations are fine. Whilst this unit will do a superb job in medium sized rooms, if you have a larger space that needs the air cleaning, then I would suggest looking at the Oransi Max which in my opinion is the best value purifier for dust, pet and other allergens for medium to large spaces. This air purifier is highly energy efficient. It’s energy star qualified. This is a big advantage for areas, which require such units to work 24 hours a day. When set to the sleep mode, the purifier doesn’t use more than 5 – 6 watts. When on turbo mode, it uses about 70 watts. Compared to similar units, this is a very low consumption rate. The manufacturer offers a 1-year limited warranty, which works in case you operate the air purifier according to the instructions. You need to keep the receipt or have other proof of the purchase date for the warranty to work. The warranty covers material and workmanship defects. I would prefer at least a 2-year warranty for an air purifier that requires an annual filter change. However, the price to quality ratio is satisfactory in this case. Please note that the warranty works only if you use the purifier in Canada or the USA. I spent several days reviewing this particular air purifier in order to make sure it does what the manufacturer claims. 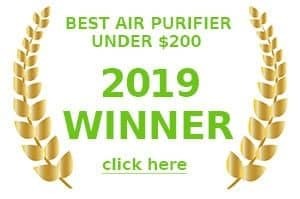 Whilst it’s not going to be able to compete with top dogs in the market like the you can find on my best purifier 2018 table , with it’s specialist filters designed for specific tasks like pet dander – Not everyone can afford the hefty price tag that come with top models. The Winix WAC9500 offers very good value for money in this regard, so I feel comfortable recommending it, as it’s one of the most moderately priced units with this variety of features on the market. While some of the features may not work perfectly, overall this purifier does a great job cleaning the air from pet dander and odors, making it a great choice for families with pets. Hope you liked our review of the Winix WAC9500 Air Purifier. Whilst it’s not the best looking of devices, it does a very reasonable job for the money they’re asking for it. One of the more popular units on Amazon currently, and gets very positive user reviews.